MCTV Arts & Humanities	 A benefit concert to raise funds for the UNICEF Water Project and the Montgomery College World Ensemble Scholarship Fund. 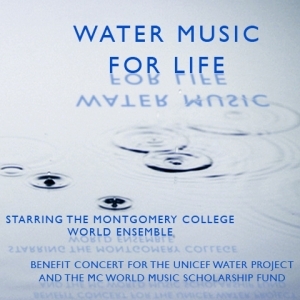 The Montgomery College Department of Music and the Montgomery College Arts Institute present "Water Music For Life", a benefit concert featuring the MC World Ensemble with special guests Amadou Kouyate, Didier Prossaird, Thomaz DeCastro, and the Wheaton High School Chorus. The concert is directed by Dawn Avery. Embed "Water Music For Life" on your page.